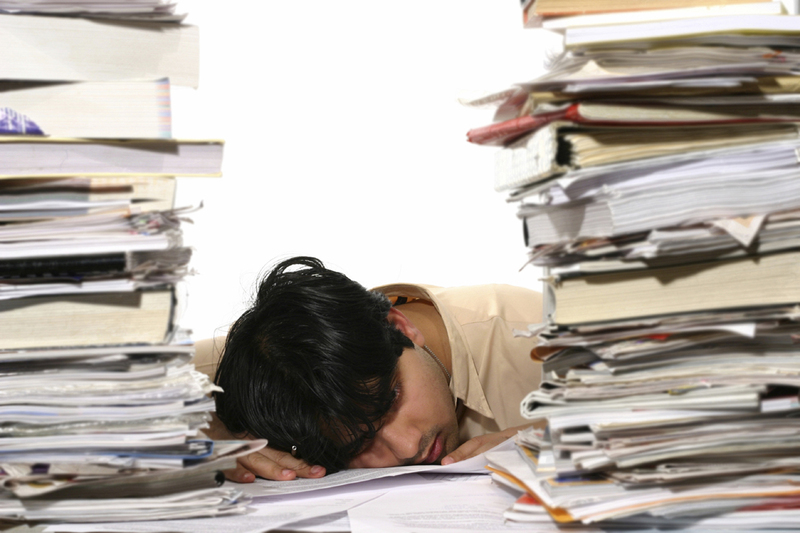 One of the biggest paper pile-ups in offices is meeting notes and handouts. One of the easiest ways to reduce this pile-up is to start using Microsoft OneNote. Microsoft OneNote is part of the Microsoft Office suite and usually available on most computers. OneNote was designed as a meeting note application and does a great job of organizing meeting notes by type and date of meeting. It has 3 levels of hierarchy-1) a “notebook” ideally one notebook for each year 2) a “section” that is a tab at top that can be used to label all standing meetings and projects 3) and the “Pages” for the actual meeting notes. 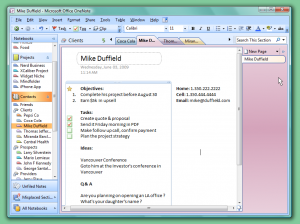 It has a good integration with Outlook that allows users to export emails to OneNote for quick reference in a meeting. As well as identify tasks and move them in two clicks to Outlook tasks. OneNote is also a mobile app and can sync notes to tablets, phone and any other computer. So take notes on your tablet and go back to your office and open OneNote and they are right there. Great embed functionality of pictures, documents, audio or video files. No need to print handouts anymore, just embed them in the page of OneNote and you have all information about the meeting in one spot. The ability to create custom tags and symbols to identify text and information. It is the electronic version of highlighting, circling, making a checkbox or underlining in handwritten notes. OneNote provides a long list of default tags and users can modify or create new tags depending on their own coding needs. As with any application or new habit it takes a little time to get used to it. But once you do, you will be glad you did, especially for busy executives and managers who are often in back to back meetings. Microsoft has a good basic tutorial on OneNote to get users started. There is also the E-SIGN Act, passed by Congress in June, 2000, which is federal law ensuring the legality of documents executed with e-signatures in the United States. The E-SIGN Act states that contracts with electronic signatures may not be denied legal effect or ruled unenforceable because they were created digitally. With most organizations the decision on using e-signatures or keeping hand-written signed documents lies with legal counsel. It is important to get their approval on e-signatures and scanned copies before destroying original documents and records. Scanning is the process of converting paper into digital documents. If an organization would like all its official data in electronic form, then it is important to clearly identify the historical documents that need to be scanned as well as future documentation received that would not in electronic form. The following questions are intended to guide and counsel the client in determining the types of documents and records to scan along with selecting a scanning process. Which historical documents should be scanned in? What documents that currently are received in paper should be converted to electronic format? Is it possible to request receiving those documents in an electronic format? What is the best process to request that (i.e., online, website, email, phone, etc.)? Who in the office can provide on-going scanning support? Are there any employees who should have access to a personal scanner? Which documents, once scanned, will need to be retained in their original paper format? Is this noted in the Records Retention policy and guidance? Which documents, once scanned, will need to be shredded for confidential purposes? Are there any documents in which text recognition is required (OCR)? Starting the paperless momentum has four primary advantages to an organization; it will improve knowledge and data management, it will increase data efficiencies; it will improve worker productivity and prepare the organization for the remote and mobile workforce environment. 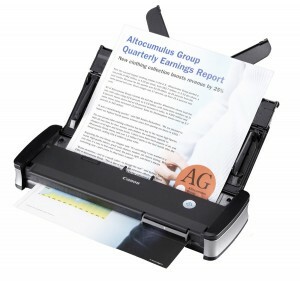 Reduce Desktop Printer s: Employees who print electronic data create their own paper pile up. 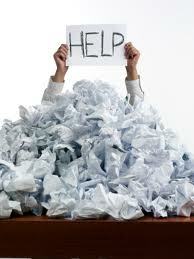 The easier and more convenient it is to print documents, the more likely it is that paper use will increase. One way to reduce paper use is to reduce individual and desktop printers. By making printing less convenient, employees begin to be more mindful before printing their data. Improve User Skills on Managing Electronic Data: If users understand how to organize, file and manage data electronically well, then they will feel more comfortable keeping data electronically and will have fewer propensities to print it. Provide training and instruction to users on best practices of filing and organizing electronic data. Improve User Knowledge on PDF Conversion and Use: Users need additional training on using PDF software. In particular how to merge and combine PDF documents, how to convert emails and other MS Office documents to PDF, how to extract/add pages into a PDF and how to make comments/notations. A large portion of paper printing is to re-scan in documents in a certain order, to remove or add pages or to add a copy of an email to an official paper file. 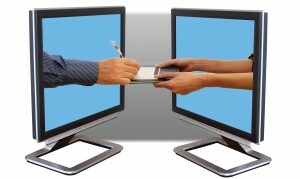 Implement e-signatures: Implement the use of signing documents electronically. Provide clear guidance and training on how to use and process e-signatures. Automate Paper Processes: There are still paper-based processes (mainly with multiple signatures needed on a document) that could be automated and managed electronically. Identify those processes that require paper printouts and engage a productivity or IT consultant to suggest electronic alternatives. According to a study by the CAP Venture Group, it is estimated that 80% of information is still retained on paper even though more than 80% of the documents we work with are already in a computer somewhere. According to Xerox, approximately 30% of printed documents are for one-time use only and further studies found that about 45% of documents printed in a typical office are thrown away within 24 hours. Another Gartner study called “Electronic Document Management” revealed that the average document was copied between nine and eleven times. One of the keys in gaining efficiencies in data management and increasing productivity is to reduce the paper workers manage. A key component to creating a paperless office is to create user trust in finding and accessing data electronically. Employees are inundated with data in multiple formats and finding it more and more difficult to manage the amount of data and be effective and efficient at their job. Without a consolidated system to manage data along with sound file structure and data management guidelines users will tend to keep a ‘backup’ copy of data and records in paper. Although paper does have its uses for work purposes such as reading, reviewing at meetings or processing data, it is not the optimal format to archive, store and file records and documents. When moving towards a paperless office it becomes even more vital that file structures, whether on a Shared Drive network or in a cloud-based system, is well-organized. It is also important that there is a clear and designated location to store data when there are multiple document and record systems available to users. Finally, data management practices need to be clearly defined such as document naming conventions, versioning, and data conventions. 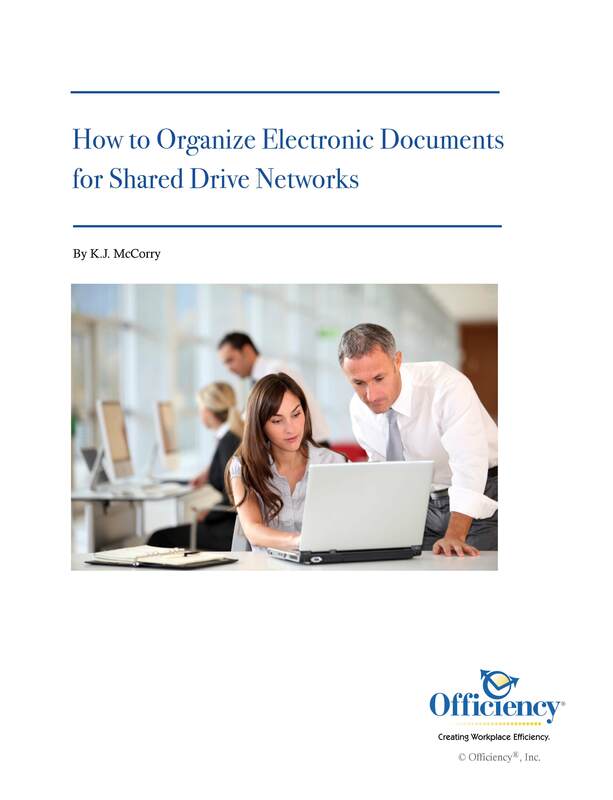 To learn how to organize electronic files on the shared drive, download the report How to Organize Electronic Documents on Shared Drive Networks. Or you are welcome to contact us and we can assist you.